This past Saturday I took a lesson from Denny Lucas and Jeff Haas (www.kelvinmiyahiragolf.com). For the past month I had been struggling with my ballstriking, only getting a few rounds in the 60's and mostly hovering in the 70 to 76 scoring range. I think that's a question that depends on the golfer, their situation and what their goal is. However, I would say that you should not take a lesson when your playing well. If anything, allow yourself to stop and smell the good ballstriking for a while. This game is difficult and frustrating enough as it is, so you're better off allowing yourself to fully enjoy playing well. When the progress stops, it's best to try and give yourself a little time to figure out a way to start progressing again. If after some time you can't make that progress...then go for a lesson. I really didn't like how my torso was more bent over and my left arm was very upright at the top of the swing. Obviously, these moves go hand in hand, so I needed to figure out a different way to stop this 'bent over trunk/upright left arm' move. 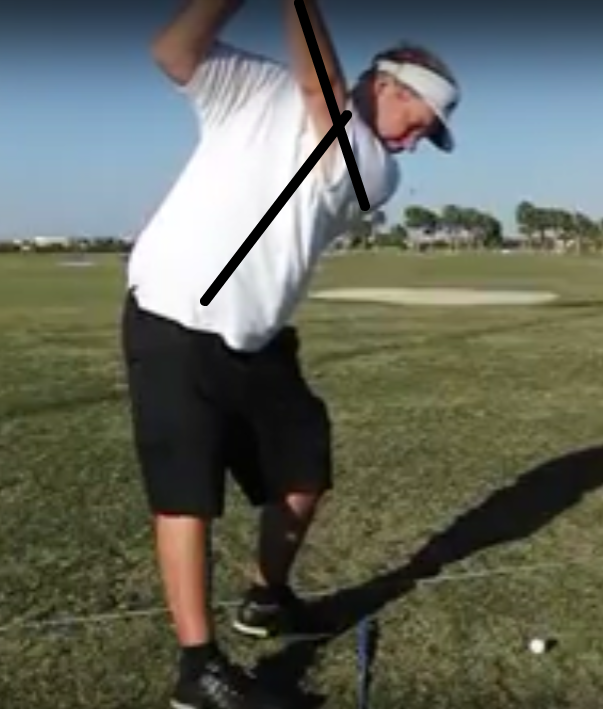 The issue I had with this move is that it requires a large move to flatten out the shaft plane and can cause early extension. Another issue I had was with my left leg position at impact. Here's a swing I made from 2016 when I was swinging well. In the bottom picture the left leg is straight and the left hip is pulled back. The issue is that I want to see more of that type of leg position and movement at impact. Instead, I wait too late for that leg position and get look at almost the finish position. 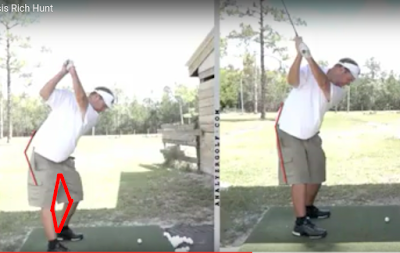 One of the first things we worked on was the backswing. As you can see below, it's much shorter. The length of the swing doesn't matter anywhere near as much as how the golfer is achieving the backswing and the compatibility of their transition move. The bigger change here is the right arm/shoulder. In the before picture, the right arm is abducted and the humerus is almost parallel to the ground. We wanted to get out of this so the move to get the shaft to flatten out in transition wasn't so big and it would be easier to rotate the pelvis instead of getting early extension in order to 'fit' the steep shaft plane into the ball at impact. 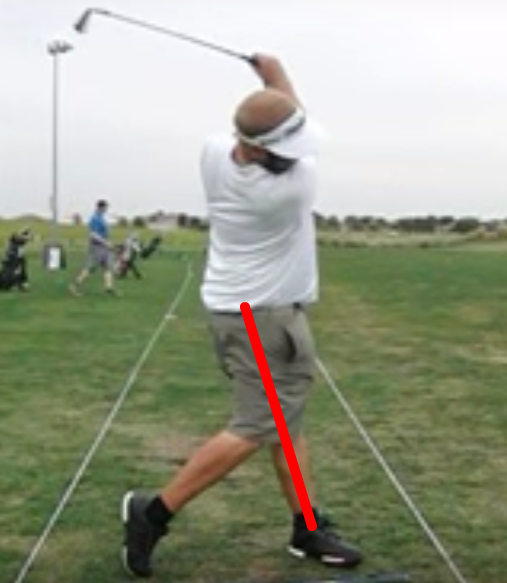 The other change in the backswing was to not get so much left knee flexion at the top of the swing and close that 'gap' between the left and right leg from the Down the Line view. The left leg needs to be straighter in order to do this. This allows the trunk to not be so bent over and helps flatten the left arm so much. 1. Generally, I try to work on things in order...from the address position to the takeaway to the backswing to transition to the downswing to the follow thru. 2. If that doesn't work, I generally try to work on the pieces I think I can start executing the soonest. 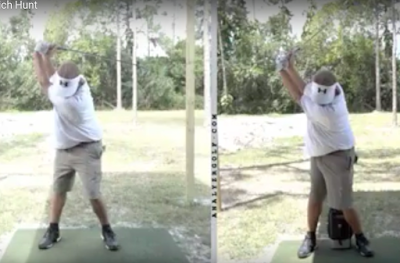 For now, I've been working on the backswing pieces (arm motion & left knee flexion). 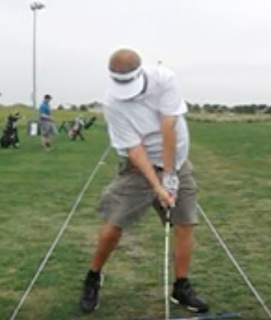 Not only are they the backswing moves, but I feel those are a little simpler for me to execute since they are not as foreign of a move as the downswing pieces we discussed. I did play the day after and just focused on the backswing pieces and played okay (74). However, I never take a round after a golf lesson with more than a grain of salt...changes take time and reps.